June 9, 2015 by Kristin U. The sustainable and local food movements have been making some serious waves around the country for several years now, largely in thanks to the millennial generation. In Orlando, Florida, a new program called Fleet Farming (FF) is rocking both of these movements. 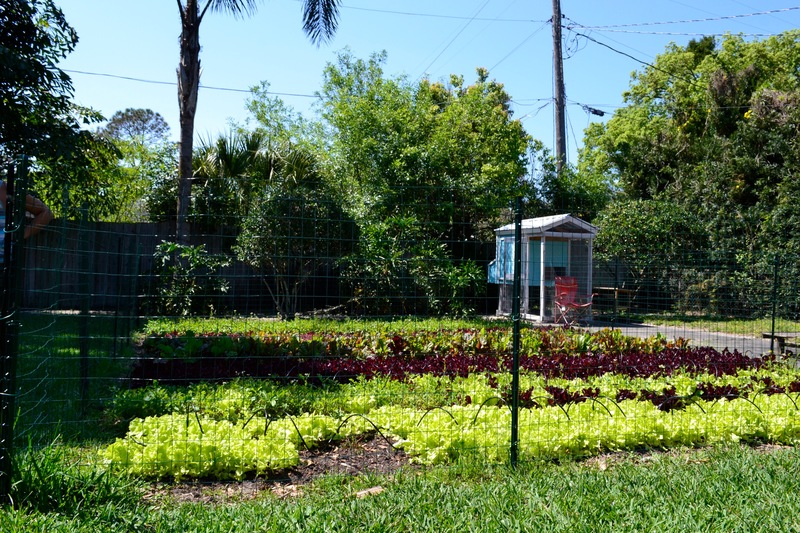 The concept Rife brought to IDEAS was simple: homeowners would “let” out their land to grow organic food that would be harvested by cycling volunteers, who would take the food to be sold at a farmer’s market and to local businesses. The idea took off, and just two months after it was proposed, the pilot program was launched. Fast forward to today, and there are now 13 homeowners within a 1.5 mile radius of East End Market who have volunteered bits of their front or backyards as farmlette hosts for Fleet Farming. FF is run by program managers Chris Castro and Heather Grove-both millennials-and a host of volunteers, the majority of whom are also millennials (including myself). But it isn’t limited to millennials. One of the farmlette hosts, who incidentally likes to water her farmlette, is 90 years old, while 10 year olds have gotten right into the dirt, helping to harvest. There are also 60 homes on the waiting list to become farmlettes, while an additional 80 are interested. However, many of these homes could be ruled out due to less than optimal growing conditions. 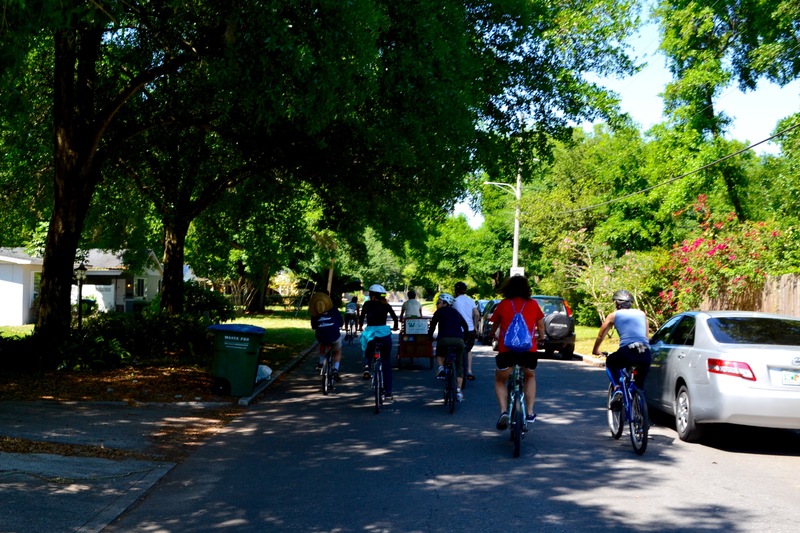 FF has a Swarm Harvest Ride once a week on Sundays: an official Swarm every other week, and a more low-key ride the alternating Sundays. Anywhere from 5-15 volunteers meet with their bikes to cycle around town, with one of the program managers towing a cart containing clippers, gloves, and harvest bins. They visit 3-4 farmlettes within a three hour span. Sometimes they see the farmlette hosts, sometimes they don’t. The volunteers typically harvest and weed, but they also establish new farmlettes and set up watering systems. The next day, Heather and the volunteers wash the greens and sell them at Audubon Park Community Market, to chefs and merchants at East End Market, and through Local Roots Farm to Restaurant Distribution. On my first Swarm ride, I chatted with a merry bunch of volunteers, maybe 10 in all. After seeding at East End Market, we rode our bikes over to our first stop: Andrea Baker’s home. Andrea Baker was one of the first to volunteer her property as a farmlette. 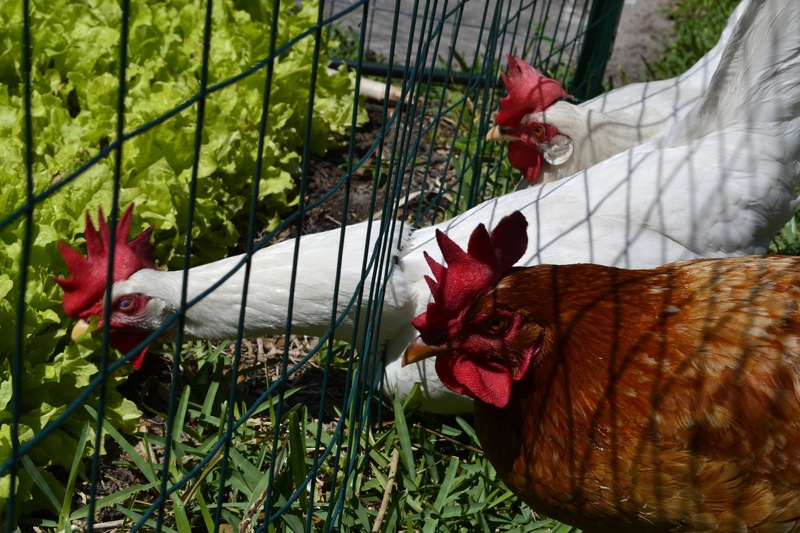 Andrea, a mom, lives in a hip-posh area of Orlando, and has several chickens in her backyard, which she acquired right around the time she signed up to be a FF farmlette host. 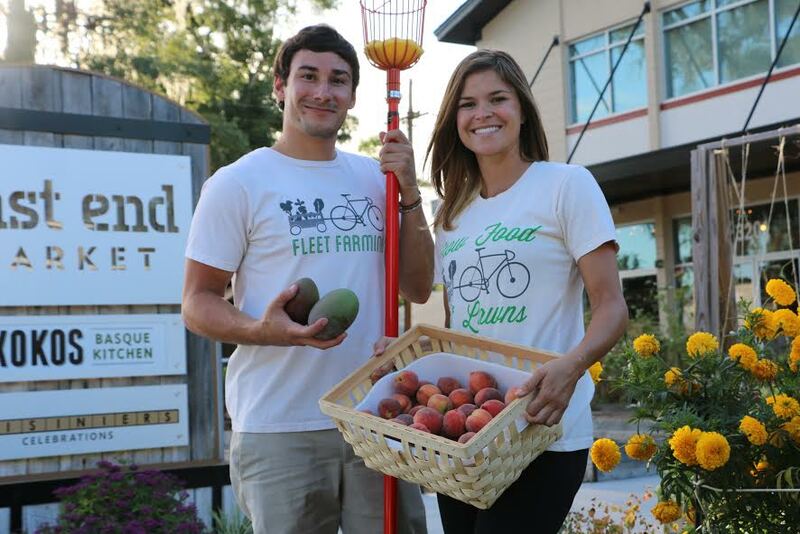 Like all of Fleet Farming’s farmlette hosts, Andrea has zero responsibilities (unless she wants to water the garden), a host of benefits, is able to use 5% of the produce, and doesn’t need to do as much lawn maintenance. 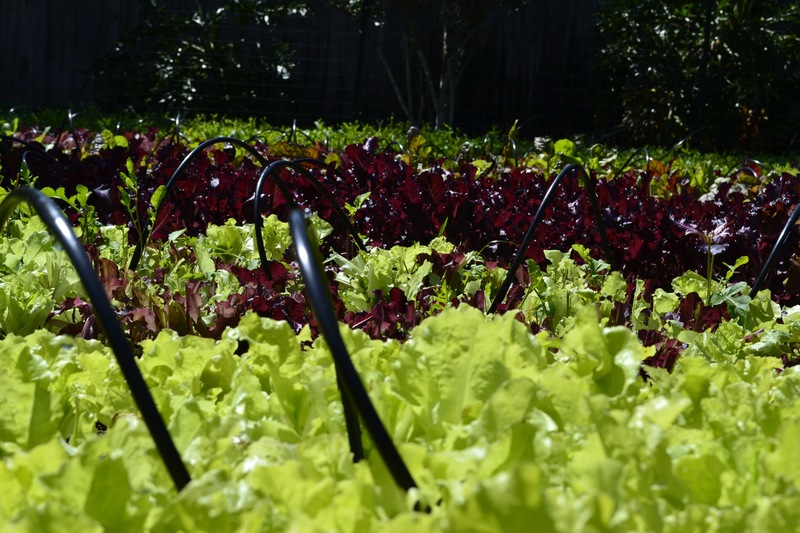 Heather points out that the hosts even get a say in what is grown from their yard, which includes over 10 varieties of lettuce and several salad mixes that include greens like kale, arugula, mizuna, chard, and bibb lettuce. It’s pretty magical for homeowners to open up their land for strangers to use, especially since homeowners can be a bit territorial. The times that I’ve volunteered on the Swarm ride, all of us are walking around the property, less than a hop-skip-and-away from the front or back door. But Andrea reveals that she “get[s] all the benefits of having a private garden with none of the difficulties,” and “to have a beautiful garden to look out the window at has become an unexpected focal point and always the first thing guests comment on when they come to my home.” She also points out that the volunteers are only on her property for about 30 minutes twice a month and on the rare occasion when there’s an issue to be addressed.